If you’ve met Adrian, you know he’s on the tallish side. If you’ve been to southern Mexico, you know that the people are closer to ‘short’ end of the spectrum… I’d guess that over 50% of the men here in don’t reach my shoulder. The women are even shorter; it’s not unusual for me to walk past a woman who comes up to my elbow. My favourite though, is when Adrian is standing directly behind someone – eg in a queue – and the person in front of him turns around for some reason, looks smack bang into Adrian’s belly, gasps in disbelief, involuntarily opens both eyes incredibly wide and loses control of their jaw muscles so that their mouth drops open, slowly looks up and up and up until they make eye contact with him, laughs out loud, grabs a hold of their friend’s arm to see if the friend has seen what they’ve seen, laughs some more, looks down to check Adrian’s not somehow randomly standing on something, shakes their head in disbelief, smiles again as if to say ‘Wow. Just WOW’, and then finally, looks away, still laughing. And – it’s something that is happening more and more the further south we travel. We are – well, Adrian is – literally turning every head in some of the streets we traverse. It’s pretty entertaining. I’ve adopted the role of co-conspirator, so that when I see someone off to the side do a double take, I turn to them and give them a wink or a nod, as if to say ‘I know – can you believe it?!!’. 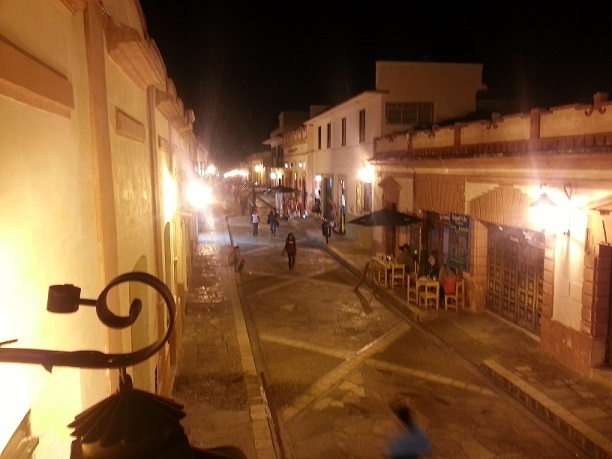 Anyway – San Cristobal is great, we’re loving having a bit of a break here. We spent quite a while today exploring the old town.. including eating and drinking in a few different places. I found a yoga class – the first time I’ve been instructed in Spanish… and that was pretty much it! This entry was posted in Mexico and tagged relaxation. Bookmark the permalink. ← Three tequila shots…. on the house! Hahaha I had been so curious how the er shorter stature Mexicans would perceive Adrian. Could you please take lots of photos of him in queues or crowds of little people?